“My expenses with five daughters*, of whom the older appear at Court and are always with us in public, require all the economy imaginable. A sum immense. Their masters, servants and wardrobes above all consume a considerable sum”. The wardrobe, in particular, she estimated to cost between £1,500 and £2,000 pounds a quarter. 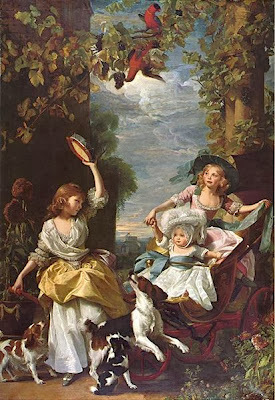 In 1786, for example, the Queen spent a £1000 on each of her young daughters, Mary and Sophia. The three elder sisters, instead, received double that sum. Little Amelia, only 3 at the time, had to “make do” with £500. It was on the dresses for the younger children, who didn’t appear in public as often, that the Queen mainly economized. Their clothes were often made by country dressmakers. The cloth used for the dresses of all the princesses was chosen by their mother, Queen Charlotte, in consultation with her milliners. The young girls, though, were allowed to pick trimmings, paint their fans and to buy cheap jewelery with their pocket money. Usually, the princesses wore morning gowns till dinner. 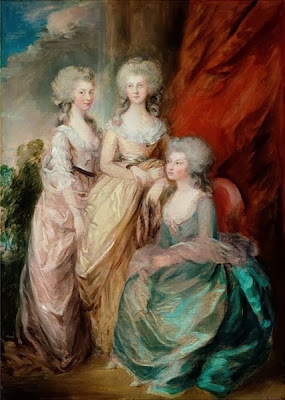 For a visit to Bulstrode in 1783, they all wore, for instance, “white muslin polonaises, white cheap hats, with white feathers.” That same year, at the Queen’s Lodge, the princesses wore “a uniform for the demi-saison, of a violet blue armozine, with gauze aprons”. For holidays and public appearances, instead, the princesses were “dressed distinctly, either exactly alike or in a same dress in different colours. As early as the Princess Royal’s thirteen birthday, for instance, she was in ‘deep orange or scarlet’ […] with Princess Augusta in pink and Elizabeth in blue.” Furthermore, these dresses were either similar or replicas of the more elaborate and grander gowns worn by their mother. Of course, their wardrobes, and its expenses were bound to increase as the princesses grew up and needed a wardrobe fit for their rank. *When she wrote this letter, her last daughter, Amelia, wasn’t born yet.